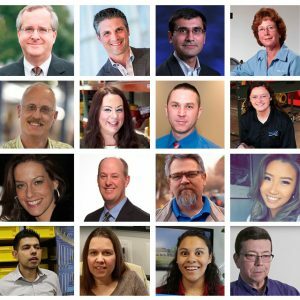 16 Amazing Entries - Who Will Win the 2017 Face of Supply Chain at ProMat? 16 Inspiring Stories – Who Will Win the 2017 Face of Supply Chain at ProMat? As a leader in the material handling and supply chain industry, MHI re-launched an awareness campaign designed to not only promote manufacturing and supply chain as an innovative and rewarding career choice but to change the perception of jobs in the industry. The goal of the #iWorkInTheSupplyChain campaign was to connect, engage and inspire next-generation workers to pursue manufacturing and supply chain careers. MHI received 16 #iWorkInTheSupplyChain blog entries, one of which will win the 2017 Face of Supply Chain Award presented during Industry Night at ProMat 2017.